In the Dominican Republic in the mid-20th century, Generalisimo Rafael Trujillo (El Jefe) ruled his tiny but strategic country with the brutal extravagance of a modern day Napoleon. Nothing threatened his fantasy of unlimited power - nothing except a secret underground movement, at the center of which were four sisters known by the code name butterflies. 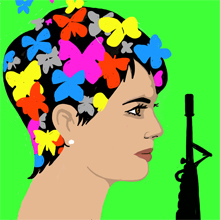 The gently blooming but unstoppable resistance against the dictator by Patria, Dedé, Minerva, and MaríaTeresa inspired novelist Julia Alvarez to write the best-selling book, In the Time of the Butterflies. The novel was selected as one of the Best Books for Young Adults by the American Library Association and has been chosen by communities all across America as a must-read through the National Endowment for the Arts’ “Big Read” program. Obie Award-winning playwright Caridad Svich (a UCSD grad) is one of America’s leading adaptors of Latin American literature.